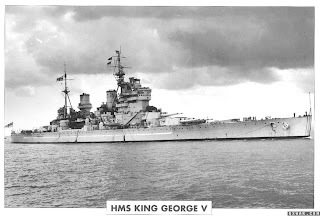 The hms King George V absolute maximum gun range in 40 degree elevation, is 36,850 yards,In terms of shell weight,KGV used 1,590 pound shells. The KGV's 14-inch guns had quite a few problems initialy in service, namely they could very easily jam in combat. 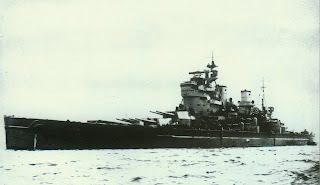 The biggest examples were the HMS Prince of Wales at The Battle of Denmark Straight, and HMS King George V at The last battle of the Bismarck. To be perfectly fair, PoW was a brand new ship that hadn't had all of its kinks ironed out. KGV's problem is attributed more toward fatigue than anything. 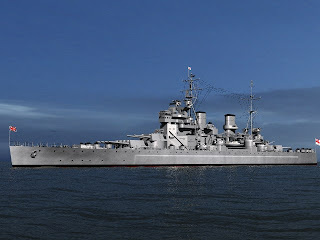 The gun in terms of operation was based off of the Mark I 15inch/42caliber gun used by the Queen Elizabeth-class, the Revenge-class battleships, the Renown-class Battlecruisers, HMS Hood, etc, in that a heavier shell would be fired from a lower velocity gun. This descion was made, in part due to the fact that the Nelson-class battleship's guns basically fired lighter shells at a higher velocity. 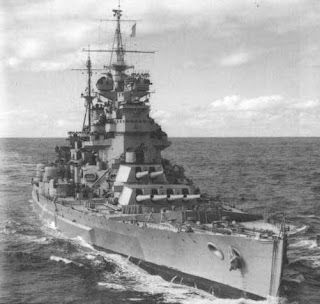 The barrel life and reliability of the 16-inch gun used on the Nelson-class was lower than the older 15-inch guns mounted on the aformented warships. Secondary guns:The King George V mounted a total of sixteen 5.25 dual-purpose guns,The 5.25 DP was a effective weapon, particularly with proximity fuses.